Did you know that the Bible is filled with verses about thanksgiving? How awesome that scripture records so many amazing Thanksgiving Bible verses perfect for helping us understand authentic gratitude and thankfulness. Whether you want to study Thanksgiving scriptures with your family as part of the fall American Thanksgiving holiday or you’d like to cultivate a more thankful heart, you’ll enjoy this list of 35 amazing Thanksgiving scripture verses. Scroll down to see these powerful Bible verses for thanksgiving! 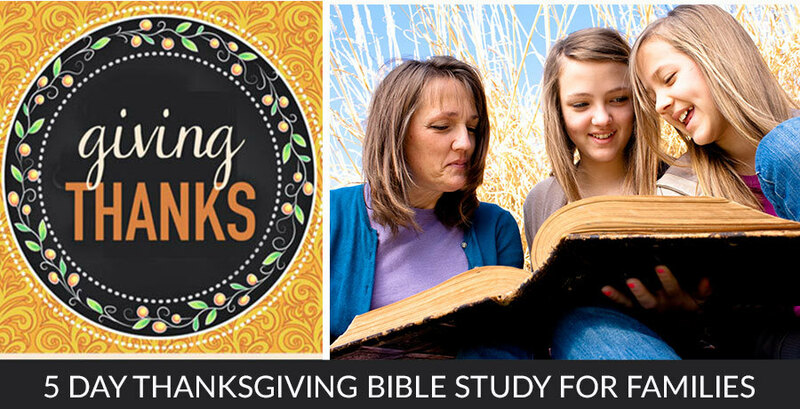 Looking for a Thanksgiving Bible Study for Your Family? Before we go any farther, I wanted to make sure you knew about the amazing 5-Day “Giving Thanks” 5Rs Bible Study. It’s perfect for kids, adults, or for entire families to do together! 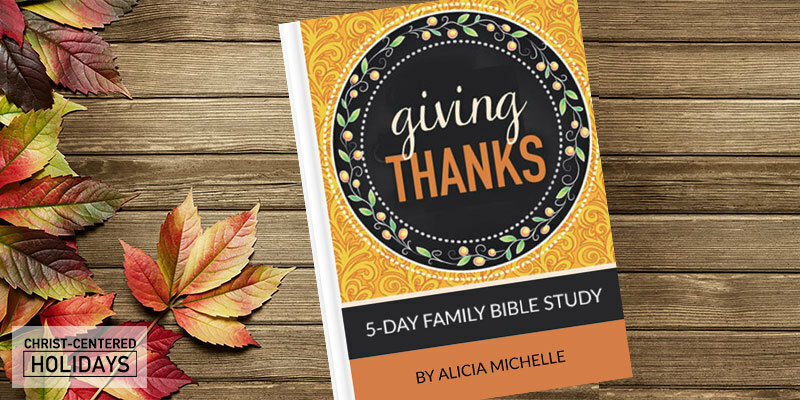 If you want an easy way to teach your family about thankfulness this fall or Thanksgiving season, then this awesome 5-day thankfulness Bible study for kids and adults is just what you’ve been looking for! It’s perfect for any family looking to grow spiritually during the Thanksgiving season. Each day contains a devotional reading, a discussion question, and selection of Bible verses to study using the 5Rs Bible Study™ Method. This Bible study is divided into five days. You can go through the study five days in a row, or you can just study one day here and there on the days leading up to Thanksgiving! Whichever works best for you and your family. Re-discover the power of a thankful heart as you explore what God’s word says about authentic thanks giving. What does it really mean to live a thankful life? How can we find thankfulness when we live in a world filled with pain and suffering? 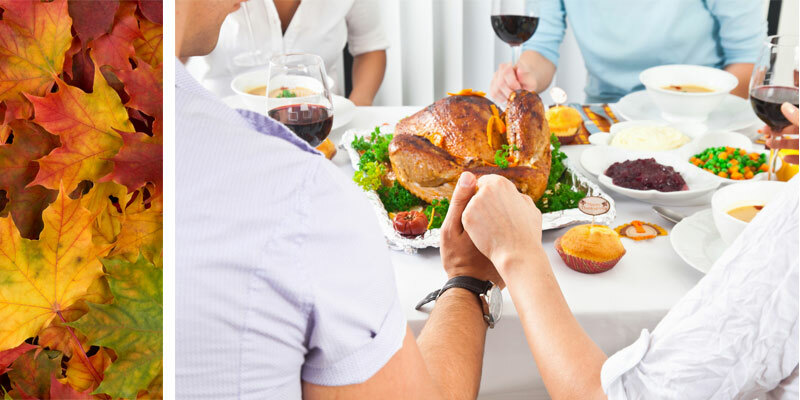 How does thanksgiving connect us with creation (and God Himself)? Why is giving thanks an important part of our relationship with God? How can we give thanks when life is difficult and we don’t feel thankful? The 5-Day “Giving Thanks” 5Rs Bible Study™ Resource is a simple but powerful way for your family to closer to God (and each other) this Thanksgiving season! Click the button below to download your copy. How Are These Thanksgiving Bible Verses Grouped? As I mentioned above, anytime is a great time to discover authentic thankfulness. It doesn’t have to be a national holiday. You also may have different reasons for looking up thanksgiving scriptures. Perhaps you want to pick some beautiful thanksgiving Bible verses for children; or maybe you want to read a thanksgiving Bible verse as part of your large family gathering for Thanksgiving dinner. Lastly, since each your preferred Bible translation may differ from mine, I’ve just included the Bible verse references here. 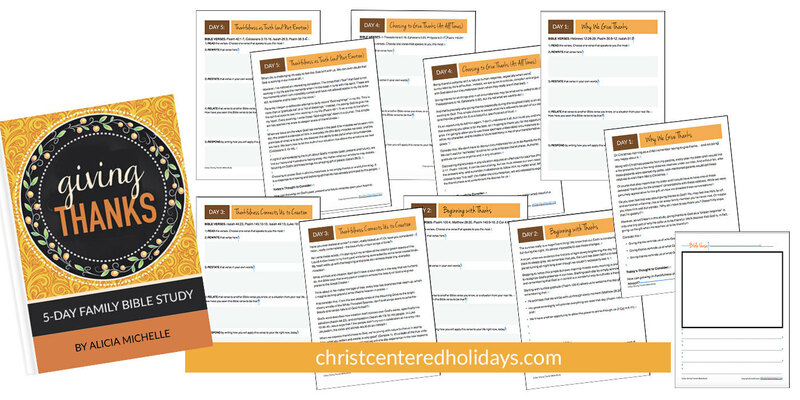 Or better yet, why not download this awesome 5-day “Giving Thanks” Bible Study for kids and adults so that you can study some of these Thanksgiving Bible verses for yourselves? It’s a wonderful way to discover authentic gratitude with your kids this Thanksgiving! Our God is amazing and so good! Doesn’t it feel wonderful to read these Thanksgiving verses from the Bible that proudly proclaim His power, His love and His enduring faithfulness to His people? Often giving thanks to God is an active choice! Our situations and circumstances are never perfect, and because of this it can be difficult to give thanks, especially during trials. However, God reminds us of the blessings that come when we decide to surrender to His ways. When we can say thank you (even through tears), we can trust God that He understands the circumstances and has allowed them in love in order for us to grow closer to Him. How amazing that the Bible gives us a written record of other Christian brothers and sisters who demonstrated thankfulness! These Thanksgiving Bible scriptures show how thanksgiving is not just something relegated to a national holiday once a year, but it can be an active part of all of our everyday celebrations. Not only can we share Bible verses on Thanksgiving that proclaim God’s goodness, we can also speak aloud great blessings to our loved ones when we tell them how thankful we are for them. I love these beautiful Thanksgiving scriptures that remind us to treasure our friends and family. The 35 verses chosen here are only a tiny sampling of what the Bible says about thankfulness! If you’re looking for more Thanksgiving Bible verses, I highly recommend getting a study Bible with a concordance like one of these. Other words you can look up in the concordance as related to thanksgiving could be “thanks,” “grateful,” “rejoice,” or “glad”. Dig into God’s word and enjoy looking up even more of these thanksgiving Bible verses! Don’t forget to get your copy of the 5-Day “Giving Thanks” Thanksgiving Bible study! As a wife and mom to four passionate kids, Alicia Michelle loves encouraging women, married couples and families with practical tips for growing closer to God during holidays like Easter, Christmas and Thanksgiving. Alicia is the owner/editor of both ChristCenteredHolidays.com and YourVibrantFamily.com; the author of Plan to Be Flexible, The Back to School Survival Manual; and the creator/producer of the "7 Days to a Less Angry Mom Online Video Course,", Christ-Centered Christmas Resources and My Memory Box Organizing System. In addition, she is a monthly contributor for several popular family blogs, including Crosswalk.com. Follow her on Facebook, Twitter, Instagram, and Pinterest.